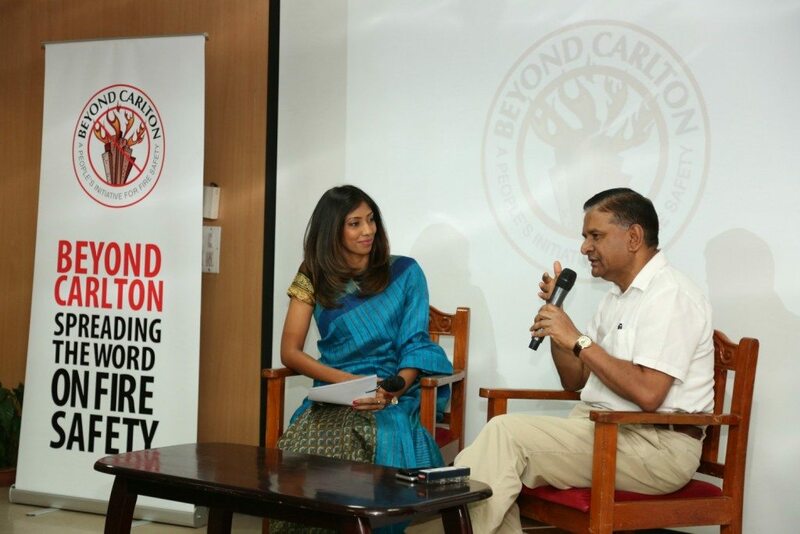 To remember and honour the memories of the nine lives that were lost in the Carlton Towers fire seven years ago, the annual Beyond Carlton Memorial Lecture was held on 25th February, 2017, in Bangalore. 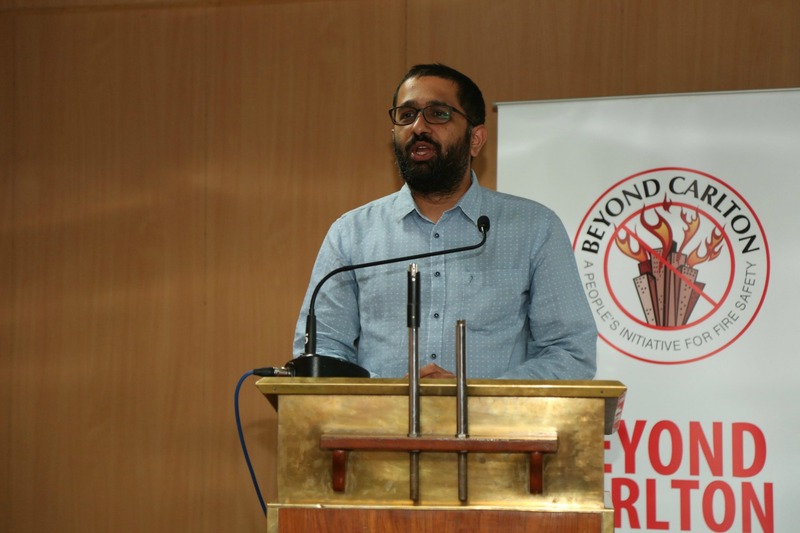 Mr. Nitin Pai, co-founder Takshshila Institutions, delivered the Memorial lecture this year. His topic was “Eight-fold path towards effective emergency services in our cities”. 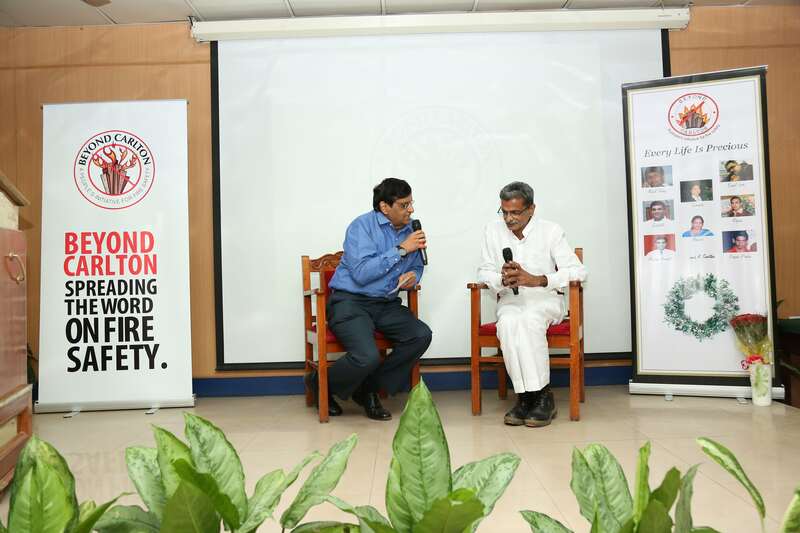 With the use of interesting statistics, he highlighted the state of The Karnataka Fire Department who were doing a good job in saving both people’s lives and property but were not speaking enough about the positive things they do. Having pointed this out, he did highlight the low budget allocations, poor infrastructure, and the lack of manpower issues that existed for the fire department in Karnataka and the long way ahead to make Karnataka more fire safe. Further, he candidly pointed out how as a society and community, we have our own problems when it comes to commitment to fire safety. Things like very low home insurance, our tendency to perceive risk from fire accidents as very minimal and add to that low corporate fire insurance, all pointed towards an apathy towards fire safety. His lecture, spiced with some interesting anecdotes from his own experience, had the audience very engaged in this year’s lecture. This was followed by a question-answer session with Shri. MN Reddy, DGP Karnataka Fire and Emergency Services. The topic was “Fire safety and the need for citizen awareness”. He mentioned that the good news was that the Beyond Carlton initiated 2011 notification had been instrumental in enabling the Fire Dept. to inspect every high rise, every two years. However, the challenge the fire department faced with compliance to fire safety procedures was quite worrisome. He also shared the future plans of The Karnataka Fire Department to spread awareness on fire safety and to make our cities fire safe. Lastly, Beyond Carlton felicitated Padma Shree Bipin Ganatra who was specially flown down by Beyond Carlton for the memorial from Kolkata. He has fought over 1000 fires along with the fire department there and saved many lives. He is not a fireman but a great source of inspiration for every citizen. In his conversation with Uday Vijayan, Managing Trustee, Beyond Carlton, he shared about what initiated him into saving lives of people in fire accidents and what today motivates him to do this. As with every year, 6 firemen nominated by Karnataka Fire Department were honoured by Beyond Carlton on this occasion. A free counselling initiative for fire accident victims and their families was also launched on this occasion. We hope that it will go a long way in providing the much-needed succour to fire accident victims and families. We thank all the attendees and participants for making the event a thought-provoking one that made us more committed towards fire safety.